Amidst the 1,055 players who registered for the $1k NLHE Ladies Tournament on Friday were about a dozen or so members of the male poker player population, and for the second year in a row the story of the Ladies tournament has become MEN. As for the tournament itself, most of the big names fell on Day 1 as the field was trimmed down to just 137 players at the end of the night –with 1 male player still remaining. Among the recognizable names still in contention are Karina Jett, Christina Lindley, Erica Schoenberg, and Amanda Baker. 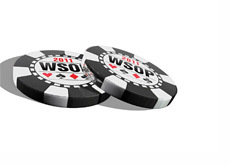 This entry was posted on Saturday, July 2nd, 2011 at 8:40 am and is filed under Poker News. You can follow any responses to this entry through the RSS 2.0 feed. You can leave a response, or trackback from your own site.